Ingredient Definitions | [All Things Tanning] For Tan Fans! What exactly are you putting on your skin? Antimicrobial, oral care agent reported to have healing, soothing, and anti-irritating properties. Produced by the oxidation of Uric Acid (product of protein metabolism from the urine of most animals) and a derivative of the Comfrey Root or Uva Ursi herb. It softens, hydrates, and heals dry skin. It promotes cellular proliferation and enhances natural skin healing properties. It is a skin softening agent with excellent soothing properties. Known as one of nature’s healing agents. The juice produced by the Aloe Vera plant is a moisture storehouse for enzymes, vitamins, proteins, and minerals that support skin functions, and skin softening. Its great skin penetrating moisturiser has the ability to break down and remove dead skin cells. Aloe Vera holds excellent anti-inflammatory properties, which soothe skin irritations caused by the sun. It enhances skin elasticity strength and is an excellent skin tone stabiliser. An emulsifier used in hairspray, shaving cream, cosmetic creams, deodorant. It is an alkanolamine, which means it is a compound of both hydroxyl group and amino group. Used in cosmetic cremes, lotions, and other products as a pH adjuster. Amino Acid (protein) that works as a water-binding agent. In the human body it is a conditionally nonessential amino acid, meaning that most of the time it can be manufactured by the body, and does not need to be obtained directly through the diet. It is also found in a wide variety of plant and animal food sources. Arginine plays an important role in cell division, the healing of wounds, removing ammonia from the body, immune function, and the release of hormones. 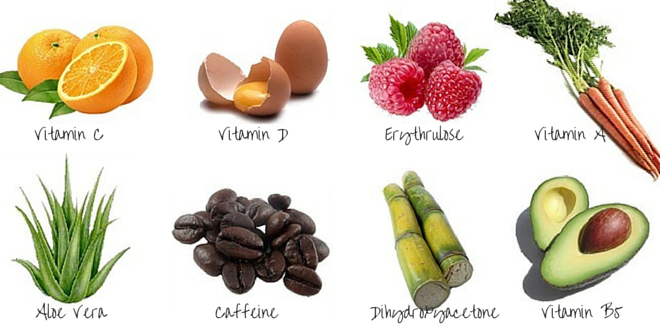 An antioxidant that controls the formation of free radicals that damage skin cells. Beta-Carotene is a strongly colored red-orange pigment abundant in plants and fruits. Extracted from the African Shea Tree fruit seed, this natural moisturising emollient is rich in Vitamins A, E, and F.
These vitamins are key in assisting the repair of damaged skin, especially from the sun and also work as a skin protector to assist in the prevention of premature wrinkles and lines. Containing unique healing properties, it is effective in promoting skin wellness through it’s soothing, anti-inflammatory and rejuvenating effects. High in triglycerides and fatty acids. Used as a thickener and stabiliser in creams, toothpaste, eye makeup, bathing products and other cosmetics. Carbomer is a term used for a series of polymers primarily made from Acrylic Acid. The Carbomers are white fluffy powders, but are frequently used as gels in cosmetics and personal care products. They can be found in a wide variety of product types including skin, hair, nail, and makeup products, as well as dentifrices. Carbomers have the ability to absorb, retain water, and swell to many times their original volume. They help to distribute or suspend an insoluble solid in a liquid. They are also used to keep emulsions from separating into their oil and liquid components. Carbomers are often used to control the consistency and flow of cosmetics and personal care products. Their common codes (910, 934, 940, 941, 960, 961, 980, 981, 934P) are an indication of molecular weight and the specific components of the polymer. Conditioning agent and topical antiseptic that is rarely used in cosmetics due to its high cost. Cetrimonium Chloride adds shine. It is also commonly used in hair conditioners and shampoos, as a conditioning agent and preservative. An emulsifier and emollient for hair tints, lipsticks, shampoos, suntan preparations. May be naturally or artificially derived. Cetyl Alcohol and Stearyl Alcohol are the two major components of Cetearyl Alcohol. At room temperature, it takes the form of a white, waxy solid. Cetearyl Alcohol and the other fatty alcohols keep an emulsion from separating into its oil and liquid components. These ingredients are also used to alter the thickness of liquid products and to increase foaming capacity or to stabilise foams. A fatty alcohol used as an emollient, emulsifier, thickener, and carrying agent for other ingredients. Can be derived naturally, as in Coconut Fatty Alcohol, or synthetically. Considered to have a low risk orally and on the skin. Though it has the word ‘alcohol’ in its name, Cetyl Alcohol is not an irritant and is completely unrelated to SD Alcohol or Ethyl Alcohol – the alcohols that commonly dry out the skin and cause irritation. At room temperature, Cetyl Alcohol takes the form of a waxy white solid or flakes. Found in baby lotions, laxatives, skin cremes and lotions, mascaras, foundations, deodorant, antiperspirants, shampoo, and other cosmetics. A colourant used in dyes. Examples; CI 19140 (FD&C Yellow#5), CI 16035 (FD&C Red#40), CI 42090 (FD&C Blue#1). These examples are food-grade colourants, which can be mixed in a proprietary ratio to develop the ‘bronzer’ (colour guide in spray tanning solutions or self tanning products) used to help the salon technician or home tanner to track where it has been applied, and gives an instantly tanned effect. They are widely used in the foods and drugs that we consume. A natural preservative and citrus fruit extract, flavouring agent in foods and pharmaceuticals. Citric Acid is an excellent skin protecting antioxidant and a rich source of Vitamin C. As a non-toxic foam stabiliser and pH adjuster in cosmetics, it is used to adjust the pH levels of many skin care products. Citric Acid holds anti-aging alpha hydroxyl properties that increase skin cell renewal rates. Mild non-ionic synthetic surfactant composed of sugar (Glucose) derived from cornstarch and fatty alcohols (Decanol) derived from coconuts. Commonly used in body washes and shampoos. Skin colouring agent often derived from plant sources such as sugar beets and sugar cane, and by the fermentation of Glycerin. DHA is the main active ingredient in all sunless tanning skin care preparations. It may be used alone or combined with other tanning components such as Erythrulose. DHA is considered the most effective sun/UV-free tanning additive. (Also known as: Glycerone). Sunless tanning products contain DHA in concentrations ranging from 1% to 15%. Most take home retail products range from 1% to 5%, with professional products ranging from 5% to 15%. The percentages correspond with the product colouration levels from light to dark. Lighter products are more beginner-friendly, but may require multiple coats to produce the desired colour depth. Darker products produce a dark tan in one coat, but are also more prone to streaking, unevenness, or off-colour tones. The artificial tan takes 2 to 4 hours to begin appearing on the skin surface, and will continue to darken for 24 to 72 hours, depending on formulation type. Once the darkening effect has occurred, the tan will not sweat off or wash away with soap or water. It will fade gradually over 3 to 10 days, in conjunction with the skin’s normal exfoliation process. Exfoliation, prolonged water submersion, or heavy sweating can lighten the tan, as these all contribute to rapid dead skin cell exfoliation (the dead skin cells are the tinted portion of the sunless tan). Current sunless tanners are formulated into sprays, lotions, gels, mousses, and cosmetic wipes. Professionally applied products include spray tanning booths, airbrush tan applications, and hand applied lotions, gels, mousses and wipes. DHA does not damage the skin, and is considered a safe skin colouring agent, being the only FDA approved ingredient for sunless tanning (skin colouration). Contact dermatitis is rarely reported. Most cases of sensitivity are due to other ingredients in the skin product preparation, such as preservatives, plant extracts, dyes or fragrances. Diazolidinyl Urea is used in many cosmetics, skin care products, shampoos and conditioners, as well as a wide range of products including bubble baths, baby wipes and household detergents. It acts as a Formaldehyde releaser, which is a chemical compound that slowly releases Formaldehyde. Formaldehyde releasers are often used as an antimicrobial preservative in cosmetics. Diazolidinyl Urea is chemically related to Imidazolidinyl Urea which is used in the same way. Some people have a contact allergy to Imidazolidinyl Urea causing Dermatitis. Such people are often also allergic to Diazolidinyl Urea. Silicone derived emollient and anti-foaming agent, giving a smooth feel to a cosmetic cream or lotion. The unique fluid properties of Silicone give it a great deal of slip and in its various forms it can feel like silk on the skin, impart emolliency, and be a water-binding agent that holds up well, even when skin becomes wet. DMDM Hydantoin is an organic compound belonging to a class of compounds known as hydantoins. It is used in the cosmetics industry and found in products like shampoos, hair conditioners, hair gels, lubricants, and skin care products. It acts as a Formaldehyde releaser, which is a chemical compound that slowly releases Formaldehyde. Formaldehyde releasers are often used as an antimicrobial preservative in cosmetics. DMDM Hydantoin works as a preservative because the released Formaldehyde makes the environment less favorable to the microorganisms. DMDM Hydantoin may cause an allergic reaction or contact Dermatitis in some people. A clear to pale-yellowish liquid, which naturally occurs in red raspberries. (Also known as: Glycerotetrulose). It is a natural-based keto-sugar that reacts with the amino acids in the keratin protein on the outer or dead surface layer of the skin (the Stratum Corneum layer of the Epidermis). This non-toxic reaction produces a temporary browning effect. This is not a stain or dye, but rather a chemical reaction that produces a colour change on all treated skin. The reaction is similar to the browning effect seen when a cut apple slice is exposed to oxygen. The brown colour is comparable to the appearance of a UV-based suntan. Because the skin continually exfoliates itself, losing thousands of dead surface skin cells each day, the tan hue is temporary. The tan appearance lasts from 2 to 10 days, depending on application type and skin condition. As a disinfectant, biocide or antimicrobial: Some topical creams, cosmetics and personal hygiene products contain derivatives of Formaldehyde as the active ingredients that prevent the growth of potentially harmful bacteria. Various solutions containing Formaldehyde can also be useful as disinfectants which kill most bacteria and fungi (including their spores), or applied topically in medicine to dry the skin, such as in the treatment of warts. Formaldehyde is used to inactivate bacterial products for toxoid vaccines (vaccines that use an inactive bacterial toxin to produce immunity). It is also used to kill unwanted viruses and bacteria that might contaminate the vaccine during production. Urinary tract infections are also often treated using a derivative of Formaldehyde (Methenamine), a method often chosen because it prevents overuse of antibiotics and the resultant development of bacterial resistance to them. In an acid environment Methenamine is converted in the kidneys to Formaldehyde, which then has an antibacterial effect in the urinary tract. Safety Warning: At concentrated levels Formaldehyde is highly toxic to all animals and humans, regardless of method of intake. Excessive Formaldehyde exposure can be toxic, allergenic, and carcinogenic. Sweet, syrupy alcohol that can be produced artificially from Propylene Alcohol or naturally derived from vegetable oils. It is a colourless, odourless, viscous liquid, used in cosmetics as a solvent, humectant, emollient, and lubricant. Can also keep water in skin and work as a skin protectant. Used as emulsifier and moistening agent for cosmetics. Isopropyl Myristate is the ester of Isopropanol and Myristic Acid. (Myristic Acid is derived from mostly vegetables, especially from Nutmeg and Palm Kernel Oil). Isopropyl Myristate is used in cosmetic and topical medicinal preparations where good absorption through the skin is desired. Found in suntan lotions, shampoo, hand lotions, deodorants, pesticides. A Palm Oil based emollient, moisturiser, thickening agent, and anti-static agent.